Kodachrome was one of the first types of colour film that was successfully mass marketed and therefore became the longest running brand of colour film. It was used for 74 years for both stills and film, and was always popular through its long years of service. 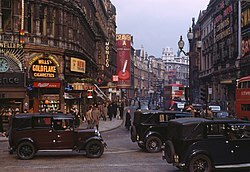 Before Kodachrome colour photography was managed by using additive methods such as autochrome or dufaycolour which used the additive screenplate method. These had their disadvantages as to be viewed they had to have very large projection lamps.